Elegant Staghorn Corals are the building blocks of the worlds coral reefs, keeping Acropora corals can create a beautiful home reef as well! SPS Corals For Beginners starts right here with the Montipora coral. Coral facts from the types of coral through live coral care! The Finger Staghorn Coral is a strong Acropora with thick branches, and it also comes in great colors! The Finger Staghorn Coral Acropora humilis is a cluster shaped coral that sports attractive cherry-reds, purples and purple tips. In each aquarium the growth shape will be slightly different, since each tank has a different water flow. 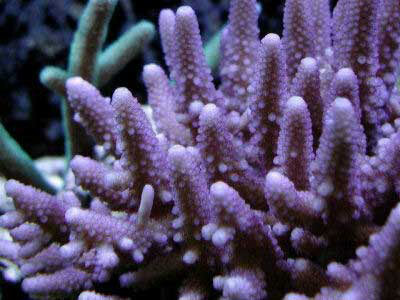 Some names they are known by for color include Purple Acropora, Pink Acropora, and Vivid Evergreen Acropora. Names they are known for by shape include Cluster Acropora, Branching Acropora, Staghorn Coral, and Finger Coral Acropora. Acropora humilis is a Cluster or Corymbose Acropora. The branches of this coral are thick and taper to a dome shape, looking similar to fingers, hence one of its common names. There will be larger branches mixed in with smaller ones. Radial corallites (the cup formed by a polyp) are found in two sizes, the larger ones in rows but increasing slightly in size towards the base of the branches. Acropora corals are some of the largest, most contributing corals for reef formations in the world. In fact, between the Acropora and Montipora corals, they make up one-third of all reef building coral species. In the wild they are the most tolerant of water temperatures, salinity changes, water movement, and lighting, but in captivity they can prove to be very difficult to keep. In the ocean, they are the first to arrive at a reef and spread quickly. Other corals that arrive later, then tend to move in. The A. humilis have been propagated in captivity thus helping to spare wild populations in the world's reefs. Buying captive propagated A. humilis helps the aquarist, since they are a little more hardy than their wild siblings, but they can still succumb to diseases typical to Acros. Acropora Coral Information: The Finger Staghorn Coral Acropora humilis was described by Dana in 1846. They are a Cluster or Corymbose Acropora. Some of their growth forms have been included in common names such as Cluster Acropora, Branching Acropora, Staghorn Coral, and Finger Coral Acropora. Their color is also used to describe them. Those names can be such things as Purple Acropora, Pink Acropora, or Vivid Evergreen Acropora, named after its hybrid color available. Acropora humilis is in what is called the humilis group of Acropora that also include A. gemmifera, A. monticulosa, A. samoensis, A. digitifera, and A. multiacuta. These are referred to as the growth form called cluster (Corymbose) with more stout, thick branches. The three species, A. humilis, A. gemmifera, and A. monticulosa are very close in appearance and are the most closely related of the group. The last three have more distinct differences. An interesting factoid is a study done on the eggs and larvae of A. humilus and the Cluster Coral A. millepora. They are the preferred food for planktivorous fish like angelfishes. The angelfish enjoyed pellets made with these coral's eggs, but when offered eggs or larvae made from Pachyseris speciosa (Lettuce Coral) the fish taste and then spit them out. This shows that not all coral eggs and larvae are palatable. The rates of survival vary from each coral species and with the types of predatorial fish in the area. Where Acropora Corals Are Found: The Acropora humilis are found in the Pacific and Indian Ocean reefs, and the Red Sea. They inhabit the Marshall Islands, Tuamotu Archipelago, and Hawaii. It is also found on the east coast of Australia in the Great Barrier Reef, Coral Sea, and at times, though uncommon on the west coast at Dampier Archipelago. Acropora Coral Habitat: The A. humilis are found on exposed upper reef slopes and reef flats where the water current is high. In the wild, Acropora spp. corals are found across the reef in various locations from turbid waters (with sediment or foreign particles stirred up or suspended in the water) to those with strong waves and high currents; from areas where there is little light to being fully exposed to the sun (and the air) at low tide. What do Acropora Corals look like: All Acropora Spp. corals have very porous and lightweight skeletons. The branches of this coral are thick and taper to a dome shape, looking similar to fingers, hence one of its common names. There will be larger branches mixed in with smaller ones. A. humilis colors can be blue, cream or brown with blue or cream tips. They can also be dark red, with hybrid colors that are too numerous to count. The branching Acropora spp. corals are characterized by fast growing terminal (or axial) polyps at the tips of the branches. The polyps at the tips secrete this corallite, constantly forming new growth in a cluster shape. These terminal polyps do not have zooxanthellae. They grow quickly because the terminal polyps are fed by the rest of the colony. This allows Acropora to outgrow other corals on the reef. Their radial corallites (the cup formed by a polyp) are found in two sizes. The larger ones are in rows and increase slightly in size towards the base of the branches. The appearance is a neat cluster look with a "ball" like shape arrangement. This growth is necessary since the A. humilis is found in very turbid water. At times, this coral is exposed to the air at low tide. Acropora Coral Life Cycles: The Finger Staghorn Coral A. humilis reaches sexual maturity within 3 to 5 years, with a branch diameter of 1.5-2.75" (4-7 cm). They can live 4 to 7 years. Acropora Coral Care: Acroporas are among the more difficult corals to keep, which is surprising as their natural habitats have a wide array of conditions. In captivity they require stable tank conditions, sudden changes may result in death. They are sensitive to temperature changes, sedimentation, chemical and other environmental stresses. They will stress very easily if the light is too low, or the water movement is not sufficient. Acropora need to be carefully acclimated to their new homes. They need to be placed in their permanent position within a tank after acclimation. It takes about 5 to 6 months for the A. humilis to regain their normal growth rates after being added to an aquarium. Moving Acropora from place to place will stress them, and possibly cause death. Acropora Coral Feeding: In the wild, Acropora corals have developed several feeding strategies. Through a symbiotic relationship with a marine algae, known as zooxanthellae, they receive the majority of their nutrients. They also capture planktonic organisms and microscopic food particles from the water column and can absorb dissolved organic matter. In captivity, feeding zooplankton once a week is the preferred choice. Copepods, Artemia, and nauplii are too large for them to ingest. But new forms of prey are being developed including invertebrate larvae and new strains of rotifers. Many feel that Acros in captivity need to be in a tank that has dissolved or solid organic matter to survive and thrive. Without this, they may seem fine for a while, but over a few months, without any visible indication, they may end up dead because of starvation. Signs of lack of food would be no new growth, polyps extending and some tissue recession. Excellent and stable tank conditions are required to keep all Acropora spp. corals. Doing water changes of 10% every 2 weeks is needed, although it is suggested that doing 5% water changes once a week will bring about amazing results. Keep the nitrate levels low. Tanks should offer high calcium levels and strontium should be added. Calcium: 400 to 450 ppm (closer to 450). If the Acro does not have enough calcium, it will not grow. There will be no tissue recession, but the polyps will be extended. Phosphates: 0, zero. Phosphates are the worst of all and all corals hate them. Magnesium: 1350-1500. Magnesium makes calcium available, so if your calcium is low, check your magnesium levels before adding any more calcium. A typical live rock/reef environment is what is needed for your Finger Staghorn Coral, along with some fish for organic matter production. A mature tank (well over a year old) is advised to increase the chance of successfully keeping Acropora. Marine Lighting: Moderate to high/intense, Metal halides are suggested. A. humilis are found on the upper, shallow, portions of the reef and reef flats where there is stronger lighting. Water Movement: Moderate to strong. A. humilis are found on the intertidal areas of the reef where there is good water circulation. The Acropora corals are peaceful, but watch out for crabs. Many experienced aquarists do not believe any crab should be kept in a closed system with Acros. Crabs are opportunistic predators, with the exception some of the symbiotic crabs like commensal crabs, and gall crabs. Acroporas are best kept in a small polyp stony (SPS) tank with only other SPS corals. They can send out digestive strands called 'acontia' that are actually used to digest neighboring corals, so keep an eye out for any problems. The exception to this would be if your system has an incredible filtration system and the Acros are at least 10" away from other corals such as zoanthids, large polyp stony (LPS) corals, and other invertebrates. Do not keep soft leather corals with your Acropora species as they are aggressive and release terpins that will eventually kill your expensive investment. Leather corals are dangerous to Acros, even in the best filtered aquariums. Some large polyp stony (LPS) corals can stretch out their tentacles and kill your Acros too, so caution is needed if you have a mixed reef. Staghorn type Acropora grow rapidly and are considered to be among the most rapid growing of the stony corals. They will reach sexual maturity within 3 to 5 years, with a branch diameter of 1.5 - 2.75" (4 - 7 cm). They fragment easily and the fragments can form new colonies. This makes them ideal candidates for captive breeding/propagation. The Acropora Spp. are male and female and can reproduce both sexually and asexually. In the wild they reproduce sexually by releasing eggs and sperm at the same time, resulting in a fertilized egg which then forms into a free-swimming planula larva. Eventually the planula larvae settles onto the substrate, becoming plankters. This then forms a tiny polyp which begins to excrete calcium carbonate and develops into a coral. Planula larvae are extremely vulnerable to predation, and very few survive. In the wild Acros reproduce asexually as well. The polyps at the tips of branching species secrete corallite around itself, forming longer branches. Acros also spread from breakage due to storms and fragmentation. Propagation is rather simple for Acropora corals. First you need to choose a healthy coral that is not showing any signs of distress. Then, simply cut a branch at least 2" long and glue the frag to a plug or rock. You can use the 2-part epoxy or underwater putties. A little tip, don't glue frags upright since they will grow faster on their sides.The slime that the coral will exude should not come in contact with any other corals and gloves are suggested. Give the frag ample water flow. Signs of stress are bleaching and receding and they will diminish and die rapidly. Transporting Acropora spp. corals can be a problem because of their shapes, the easily broken outer edges of the coral skeleton, and the ease with which they become stressed. They are also susceptible to almost every coral disease including white-band disease, black-band disease, necrosis, etc. Acropora is particularly susceptible to rapid tissue necrosis (RTN), especially specimens from the wild. There are many animals that will prey on Acropora spp. corals. Some Acropora have symbiotic relationships with crabs and shrimps that may help them against predators. Other hitchhikers may actually be predators so careful observation must be done. Chocolate sea stars and others from the same genus will eat your Acropora. Acropora Corals for Sale: The Finger Staghorn Coral A. humilis can be found easily online and at pet stores, as well as from frag farmers and most reef clubs. Online they can run about $30.00 USD or more depending on size and color. Many Acropora spp. corals have been propagated by fragmentation. It is not difficult to find captive-bred colonies of Acropora corals for sale or trade. Captive-bred corals may tolerate less intense lighting and water movement as well as possibly being easier to care for than those taken from the wild.